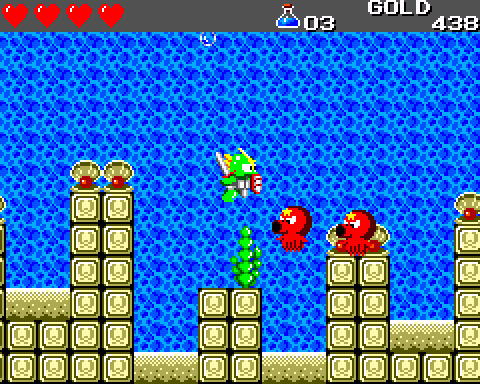 Westone Bit Entertainment’s 1987 arcade game Wonder Boy in Monster Land stood out from its predecessor in that how incorporated RPG elements into its gameplay. Though action-RPGs had certainly existed before 1987, it was exceptionally rare to see them in arcade titles. When a port was created for Sega’s primary home console, the Master System, critics had a lot of praise for it. Specifically, they enjoyed how the mixture of arcade action and role-playing elements resulted in a unique hybrid. Naturally, with a winning franchise on their hands, Westone saw fit to make a sequel. However, this installment would differ from its two predecessors in that it was specifically designed as a console game. It originally debuted on the Master System in 1989 in North America and Europe. It was then ported to the PC Engine, known as the TurboGrafx-16 in North America, in 1991 before seeing a release on Sega’s portable console, the Game Gear, the following year. 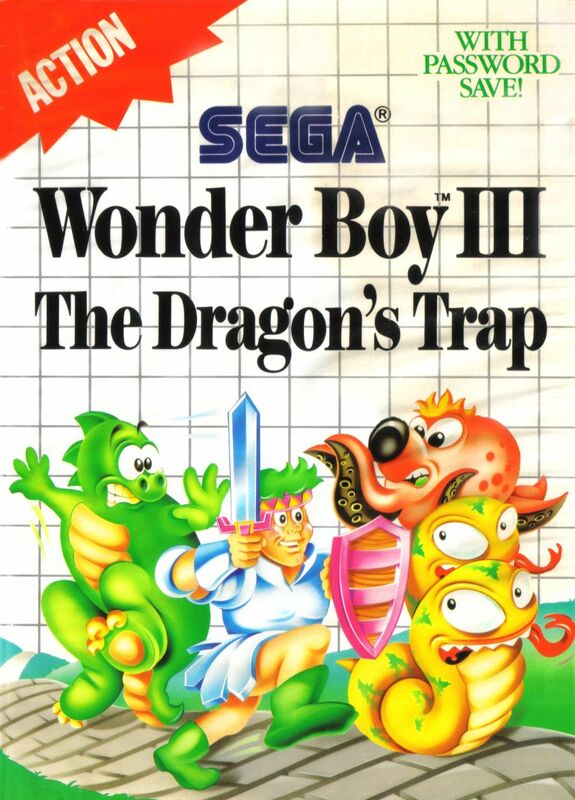 Whether it was called Wonder Boy III: The Dragon’s Trap, Dragon’s Curse, or Wonder Boy: The Dragon’s Trap, the game received largely positive reviews. Electronic Gaming Monthly deemed it the Master System’s greatest game of 1989, and other publications noted how addictive it managed to be. 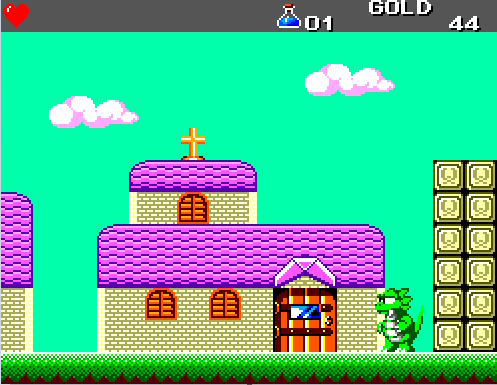 Like Wonder Boy in Monster Land, Wonder Boy III: The Dragon’s Trap is thought of as one of the hallmarks of the Master System. Was it truly able to deliver an experience worthy of the increasingly venerable Wonder Boy brand? Wonder Boy III begins exactly where Wonder Boy in Monster Land ended. The game’s protagonist, a teenager named Bocke Lee Temjin, gained fame around the world when he defeated the evil king and saved his girlfriend Tanya. The people bestowed onto him the title “Wonder Boy”. The defeat of the evil king ushered in an era of peace that lasted for eleven years. The peace was shattered when a fire-breathing dragon appeared and began terrorizing the land. With no one skilled enough to fell the dragon, they turned to Wonder Boy in their hour of need. After many trials and tribulations, Wonder Boy has arrived at the dragon’s lair in order to slay it. Those returning from Wonder Boy in Monster Land may dread the fact that the prologue takes place in the second installment’s final dungeon. Fortunately, the Mecha Dragon’s lair has been repurposed from a hellish maze with abundant hidden doors and a strict time limit to a standard, fairly linear tutorial dungeon. You can take advantage of this retcon to learn how the game is played. As per usual, Wonder Boy’s health is measured in hearts, of which he has nine. This doesn’t necessarily mean that Wonder Boy can only take nine hits without dying. The various monsters and hazards he encounters inflict different amounts of damage. Unlike in The Legend of Zelda, which uses similar graphics to represent health, you can see exactly how much of each heart remains in the meter. Just like its predecessor, Wonder Boy III is a platforming game. You control Wonder Boy’s movements by pressing left or right on the control pad. Holding down on the control pad allows him to duck. Pressing the “1” button causes him to attack with his sword. It should be noted that rather than swinging the sword, Wonder Boy stabs directly in front of him. Meanwhile, the “2” button is used for jumping. When he is not attacking, Wonder Boy automatically raises his shield. The shield can block projectiles, but it is ill-suited for stopping melee attacks. Projectiles typically inflict greater amounts of damage than melee attacks or collisions, so smart use of the shield is vital to surviving in this game. If your character is struck by an enemy, you don’t have to worry about him taking multiple hits in succession. If such a scenario occurs, only the first strike will inflict damage; any subsequent hits will merely knock him back. Upon vanquishing the various monsters you may encounter in the Mecha Dragon’s castle, you may be rewarded with gold, magic items, or health refills. Gold can take the form of a coin or the classic money bag adorned with a dollar sign. The main difference is that collecting bags yields a greater amount of gold than coins. 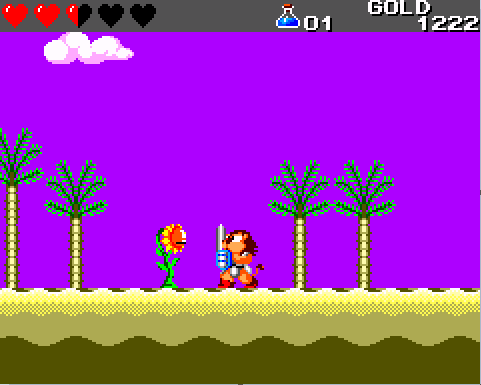 Similar to Wonder Boy in Monster Land, magic items give the main character a form of ranged attack. There are five such items: fireballs, tornados, arrows, boomerangs, and thunderbolts. Because Wonder Boy can only thrust the sword, magic is used to circumvent this limitation. For example, arrows shoot directly up in the air while tornados drop to the ground, allowing him to strike enemies on a lower level. Magic items are used by holding down on the control pad and pressing “2” at the same time. Finally, health refills come in the form of hearts, matching how the meter is depicted. A single refill refills a significant portion of a heart container. Certain enemies drop larger hearts, which are guaranteed to refill most of his health. If you’re particularly lucky, an enemy may drop a potion. These wondrous elixirs restore Wonder Boy’s health when it has been completely depleted. The Mecha Dragon’s castle is a fairly straightforward maze. Its structure is strikingly similar to that of certain castle stages in Super Mario Bros. wherein the corridors repeat endlessly until you take the correct path. There is no way to determine beforehand what path you must take to reach the end other than through trial and error. 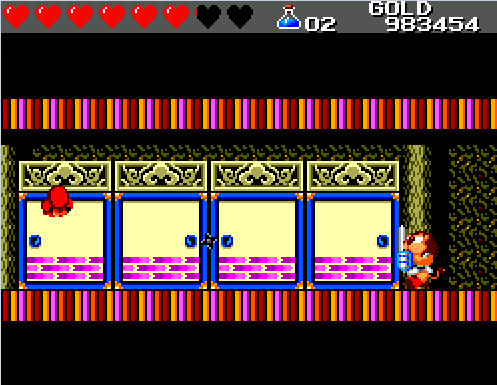 When Wonder Boy enters the boss chamber, the door closes behind him and a duel to the death ensues. Despite being the rather difficult endboss of Wonder Boy in Monster Land, the Mecha Dragon is fairly simple in this game. Its attacks inflict paltry amounts of damage, and each successful sword strike takes away a fair chunk of its health. The Mecha Dragon’s castle was markedly different than a contemporary introductory stage. Rather than actively making the stage itself easy so players can ease themselves into the game, Wonder Boy III takes advantage of its mechanics by empowering the protagonist. That is to say, Wonder Boy starts the game all-powerful so players can experiment with the controls and become accustomed to them. The metaphorical training wheels come off in a very creative way. 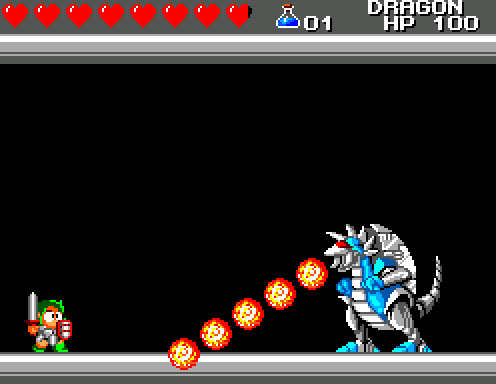 Upon being vanquished, the Mecha Dragon’s soul leaves its body and merges with Wonder Boy. This cannot be prevented; you can dodge the soul as much as you like, but the game will not advance until it makes contact. Once it does, the game’s subtitle is made relevant when it inflicts a curse on Wonder Boy, trapping him in the form of a flightless dragon – a Lizard-Man. On top of that, the Mecha Dragon’s sudden departure causes its castle to begin crumbling, forcing the cursed Wonder Boy to flee. Though the Mecha Dragon has been vanquished, Wonder Boy has a new problem on his hands – or perhaps better put, his claws. As the dragon’s curse will not simply vanish over time, he must seek out an antidote to his affliction. The only thing capable of lifting the curse is an artifact known as the Salamander Cross. It turns out that the Mecha Dragon was merely one of many dragons taking up residence in Monster Land. Only by defeating the remaining five dragons will the Salamander Cross appear. In this new, monstrous form, Wonder Boy sets out on a perilous quest. His journey begins in the serene town of Alsedo. From here, the game becomes significantly less linear. Rather than placing you at the entrance to the first dungeon, the onus is on you to seek it out. The first building you will come across in town is a church. Said church is run by an eyepatch-wearing, chain-smoking pig man. Despite the decidedly anomalous contrast, said man helps you on your quest by giving you a password. That’s right; you no longer need to worry about clearing the entire game in a single session. Indeed, if you do die, the consequences are minimal; you lose all of your magic items and are sent back to the church. However, not only do you keep all of your quest items, including any equipment you may have procured, you even get a shot at winning something that may help you on your return trip. When you choose to continue, a roulette wheel made of hearts appears. If the icon lands on a red heart, you will obtain a potion. Wonder Boy III is not quite a true action-RPG, as the hero does not gain experience points from defeating monsters. There are, however, many elements of the genre to be found in this game. By pressing the “PAUSE” button, you can examine Wonder Boy’s status and current equipment. As a further result of the curse, Wonder Boy’s Legendary equipment has been transformed into Ivory. Because of these pieces’ dubious legality, or more pressingly, their terrible stats, your first order of business it to find anything capable of increasing his survivability. The good news is that there are quite a number of shops throughout the land owned by the same pig man who runs the church – including a few in Alsedo. Wonder Boy can have equipped at any given time a sword, a shield, and a pair of armor. Selecting equipment is straightforward enough; swords increase the amount of damage Wonder Boy inflicts with each attack whereas shields and armor reduces the damage he takes in turn from enemies. Despite his Lizard-Man form breathing fire as his primary means of defense, equipping a better sword will still increase his damage output. As he cannot hold a shield in this form, Wonder Boy must instead resort to using his fireballs to incinerate any projectiles sent his way. As it’s considered one of the best games of the third console generation, many great things can be said about Wonder Boy III. The ideal place to begin would be its premise. Even as early as 1989, the idea of the protagonist being cursed into a form that drastically weakens them had been implemented before. One of the first instances was in Nihon Falcom’s 1988 action-RPG Ys II. Nearing the end of the game, its protagonist, Adol, is transformed into a monster by the primary antagonist’s second-in-command. Though it doesn’t actually affect his combat performance, it prevents him from speaking with NPCs. From there, he must scour the dungeon in search of the items capable of restoring his human form. Wonder Boy III takes this concept and fleshes it out quite a bit more. While lifting Adol’s curse involved a fairly long, though not terribly drawn-out fetch quest, seeking an antidote for Wonder Boy’s affliction constitutes the entire game. In fact, the prologue is the only section of the game in which you will ever see Wonder Boy in his human form. 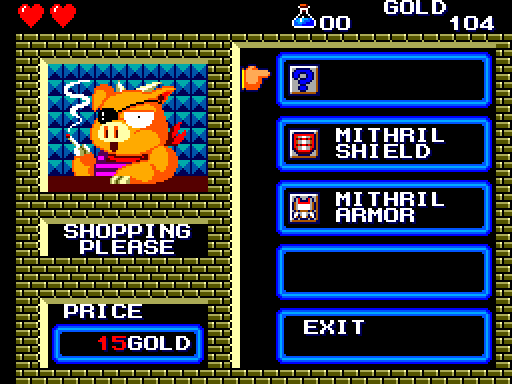 Though NPCs won’t suddenly refuse to talk with Wonder Boy in his monster form, you notice shopkeepers withholding certain items from you. You’ll know this is happening when a shop item is rendered in question marks. Only by possessing enough Charm Points will they express interest in selling you their best wares. Charm Points can be thought of as the Wonder Boy take on the Charisma stat from Dungeons & Dragons. They are determined by your equipment and rare items called charm stones. Another variable that determines Wonder Boy’s Charm Points comes into play when he has defeated the second boss. His journey takes him to a pyramid in the middle of a vast, dry desert. Inside the pyramid is, appropriately enough, a Mummy Dragon. Defeating it releases its soul. When it inevitably makes contact with Wonder Boy, he finds himself cursed once more, this time taking the form of a Mouse-Man. Despite his small stature, the Mouse-Man is actually a fair bit stronger and hardier than the Lizard-Man. Not only can he can take advantage of his smaller form by easily fitting into areas his human self couldn’t, he is also able to climb checkerboard bricks. Mouse-Man also possesses more Charm Points than Lizard-Man, allowing Wonder Boy to purchase better equipment. This is where the true nature of Wonder Boy III becomes apparent. Every time you defeat a dragon, a new curse is inflicted upon Wonder Boy, trapping him in the form of a new monster. However, you will quickly learn that these curses are only so in the most nominal sense of the word. Though none of the forms are as statistically powerful as Wonder Boy’s human form, they more than make up for their shortcomings with their utility. 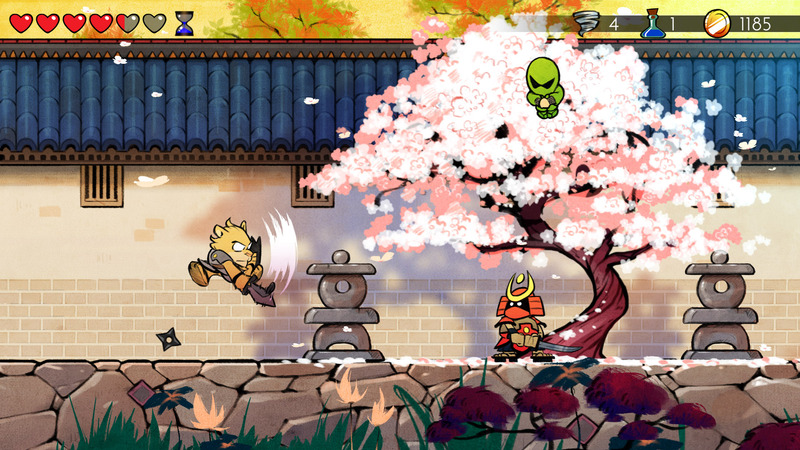 Later in the game, Wonder Boy gains three more forms: Piranha-Man, Lion-Man, and Hawk-Man. Though most of Wonder Boy’s forms can freely enter water without fear of drowning, only Piranha-Man can actually swim in it. Lion-Man is the strongest form and swings the sword downward as opposed to stabbing in front of him. This allows him to potentially hit targets both below and above him. This ability is especially useful once he has obtained the Thunder Saber, which is capable of breaking certain blocks. Finally, Hawk-Man, though being Wonder Boy’s second weakest form, is capable of flying. In exchange, water damages him. With each cursed form and certain enchanted items allowing the hero to access new areas, Wonder Boy III is Westone’s take on the iconic exploratory gameplay in Metroid. While Nintendo’s 1986 effort was good for its time, I have to remark that Wonder Boy III is a considerably more sophisticated take on the genre. When it comes to assessing what this game does well, I feel it pays to compliment an aspect that is easy to take for granted: the password system. Considering the sheer number of variables that are recorded, the passwords are noticeably short, being only fifteen characters long. By comparison, Metroid required players to jot down passwords that were twenty-four characters long despite storing roughly the same amount of information. Westone accomplished this feat using various space-saving measures. First of all, money is stored and saved in scientific notation, condensing twenty bits into eight. Furthermore, the eight heart containers you can find are not differentiated. Only the number you have found is recorded. The downside is that you have to find them in the intended order, or else the chest intended to contain them will be empty. Lastly, magic items have fixed numbers, meaning that they too don’t have to be saved. Given how easy it was to write passwords down incorrectly back in 1989, their short length greatly reduces the risk. Otherwise, when it comes to the gameplay itself, I think Wonder Boy III is the one of the first titles to truly understand what Metroid was going for. Metroid encouraged exploration, but it was ultimately undermined by the fact that the corridors had a boring design to them. Though graphics certainly don’t make a game, the monotonous design of Metroid made exploration tedious when you realized you seldom knew where you were at any given point. Because the regions of Wonder Boy III are all distinct and easy to find, you will never find the lack of a map a critical setback. No, it doesn’t make any sense that the path to the beach is in the town’s well or entering a door in the sky takes our hero to a desert, but this curious world layout makes it oddly easy to remember to find your way around. If the regions were merely easier to navigate, they would have a substantial advantage over Planet Zebes, but it doesn’t stop there. I must also point out that the level design itself is solid. 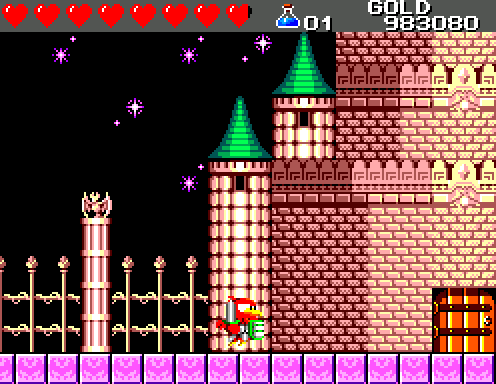 The easiest trap Wonder Boy III could have fallen into would be to merely place the stages in a way that you only had to march into them after obtaining a new form. The game appears to do this at first before revealing itself to be more sophisticated than that. The beach is the first region you explore as Lizard-Man, yet you must return after having transformed into Piranha-Man and obtained the Thunder Saber in order to enter the dungeon in which one of the dragons resides. This is reflected in how one of the shops in the region sells a shield that greatly benefits Lion-Man – the form obtained after defeating said boss. What I find particularly astonishing about Wonder Boy III is how much personality its art style has. Just seeing the pig men running the shops for the first time lets you know you’re not playing your average platforming game. 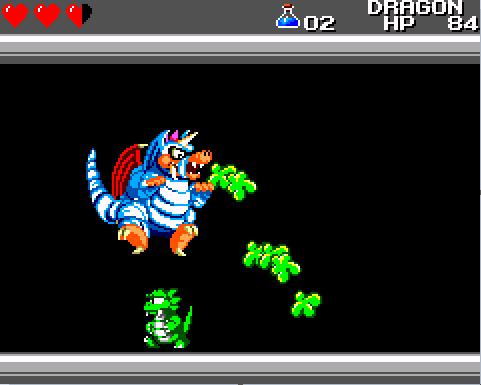 Indeed, with monsters only existing in contemporary efforts to impede the player’s progress, playing as them and making use of their unique abilities was quite the innovative idea – one that continues to give Wonder Boy III a standout identity. You would be hard-pressed to find another game wherein a Lion Man singlehandedly storms a Japanese-style castle, fighting through swaths of oni, ninja, and samurai. Because Wonder Boy III was made before the genre Metroid invented had a name, it does fall short in a number of ways. Newcomers in particular are going to have to adjust to the somewhat unpolished controls. This manifests in a number of ways, but to begin with, timing the sword is a little tricky. The sword doesn’t have much reach, nor does it remain onscreen for a particularly long time. This means you must press the “1” button just before you’re about to make contact with the enemy. Consequently, it’s especially tricky to strike airborne enemies, as you must jump and swing the sword at the right moment for it to count. The controls are also a bit tricky whenever you must make precise jumps. Thankfully, unlike in Zelda II, the world of Wonder Boy III is utterly devoid of bottomless pits, so you don’t have to risk dying instantly at any point. You do, however, have to contend with glowing blue rocks that cause obscene amounts of damage. These rocks have a deceptively large hitbox, meaning your jumps have to be exact. They are often in the same rooms as clouds rain fireballs onto Wonder Boy, making things even more chaotic. The difficult maneuvering comes to a head whenever you’re made to control Mouse-Man. Using him is already quite daunting due to his shorter reach, but his wall-clinging ability is rather tedious. To begin with, it’s a little difficult to tell if he is clinging onto a checkered surface. It’s indicated by him running in place, which takes practice to read properly. You also have to contend with how he will detach from a checkered block. With only a few seconds to react, you better hope you go through the correct motions. It’s also easy to accidently bring him into the aforementioned samurai palace due to many objectives around the midgame being unclear. Doing so will result in an unwinnable battle against the boss, assuming you survive the gauntlet. A minor annoyance involves the Charm Point system. In theory, it’s an interesting idea that shows Westone was thinking about the full implications of Wonder Boy’s cursed forms. After all, many of them wouldn’t look out of place among the minions of the six dragons. Why would the shopkeepers want to help them in any way? Practicably, it’s just another item to grind for. You can even take advantage of the fact that the game doesn’t actually record which treasure chests have been opened. By finding a chest that dispenses charm stones, you can get a password, reset, and seek it down once more until you have enough to convince the shopkeepers to sell their best items. What I feel to be this game’s biggest problem is how difficult it is to switch between forms. To be fair, the levels are designed in a way so that you will rarely have to switch forms on the field. Whenever you must, you can count on a transformation chamber to be nearby. Indeed, after gaining the Thunder Saber, you can uncover a hidden door in Alsedo that leads to one such chamber. It’s still a decidedly tedious process. There is a weapon called the Tasmanian Sword that allows you to freely switch between forms, but it requires a button command on the second controller, which is cumbersome to say the least. Because of the difficulty when it comes to switching forms, you likely won’t use Lizard-Man after Wonder Boy transforms into Mouse-Man for the first time. This would appear to be a blessing because he is the weakest form from a statistical standpoint and he cannot fully explore areas in which he can utilize his lava immunity. 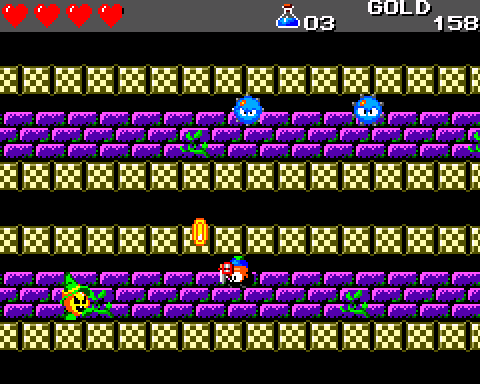 In fact, the final dungeon requires Wonder Boy to cycle between forms and only Lizard-Man is unused. However, Lizard-Man’s ranged attacks allow you to pick off enemies from a safe distance, rendering Mouse-Man the weakest fighter due to his terrible range. It’s a shame because there is an excellent balance between Wonder Boy’s other forms to the point where they never become useless at any point. Even in the face of these shortcomings, Wonder Boy III manages to be a highly engrossing game because, at the end of the day, it throws a lot of surprisingly complex concepts without weighing down the experience to unbearable degrees. The world of Wonder Boy III is fun to explore, and if you can tolerate its flaws, you will find completing the game a rewarding experience. Metroid was a pioneering game in 1986. There weren’t many mainstream experiences in which players had to explore a single, sprawling level that gradually opened up with every power-up they collected. Eventually, Konami would follow in Nintendo’s footsteps when they released Castlevania: Symphony of the Night in 1998. The familiar arcade-style gameplay of Castlevania was nowhere to be seen. In its stead was a level design akin to Metroid. When Symphony of the Night received its vindication, gamers at last had a term for this subgenre: the Metroidvania. Because part of its name can be found in the genre’s name, Metroid is typically thought of as the first Metroidvania. Whether or not this is true is debatable because many efforts from around the same time such as Nihon Falcom’s Xanadu or Robert Yeager’s Montezuma’s Revenge boasted many of the elements typical of a Metroidvania. Still, as a direct result of its success, the impact Metroid had on the medium cannot be denied. However, while many consider Metroid the first Metroidvania, I would argue Wonder Boy III was the first good Metroidvania. With a unique premise, a comprehensible level design, and many subtle touches of stellar programming, Wonder Boy III has a legitimate claim as one of the best titles in the Master System library. As such, anyone who fancies themselves a connoisseur of 8-bit games should try it for themselves. If you find you just can’t get into the game no matter how hard you try, you’re in luck, for there is still a way to enjoy it in a positive light. In 2017, a remake simply entitled Wonder Boy: The Dragon’s Trap surfaced. The remake was originally conceived in 1998 by programmer Omar Cornut, though it wouldn’t be until 2013 until development began. The remake was developed by reverse engineering the Master System version’s code, making it quite the impressive technical achievement. Calling themselves Lizardcube, Mr. Cornut teamed up with artist Ben Fiquet to see this project through. They even collaborated with Ryuichi Nishizawa, who designed the original game. Though the physics are largely unchanged, the remake is nothing short of breathtaking, featuring an incredible art style that allows the game’s personality to shine brighter than ever before. You can even receive functional passwords for the original game from the church. Coupled with a remixed soundtrack, I could tell this was a passion project in the purest sense of the term, and that is truly admirable. If you’re going to try any version of the game, this is the one to play. Wonder Boy III stands to this day as an underrated classic I could easily recommend to any enthusiast. The remake looks very pretty. The option of typing out passwords is a nice throwback, but I will stick to saving. I have a bad habit is writing down things wrong and then losing my progress. I agree with that; Ben Fiquet should be really proud of himself. 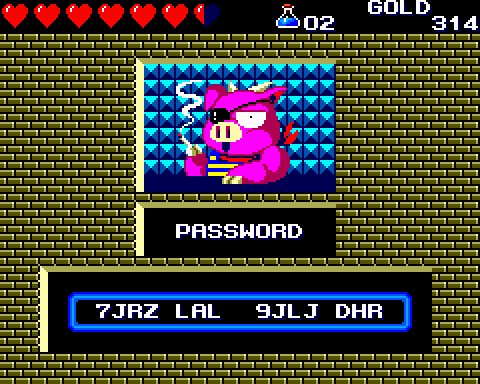 I couldn’t find a way to actually input passwords in the remake, so I think they’re intended to be used in the Master System version. Either way, that gives me flashbacks to when I played NHL ’94 on the SNES. Every now and again, I would write down the passwords incorrectly and be frustrated that I couldn’t continue the playoffs. I can imagine that was quite a common scenario back in the day, so I’m glad save files became the norm. The game caught my eye when the Switch version showed up, but since I had never played the originals I had no idea whether or not it was actually any good. Some mixed reactions that I read did not help in that regard either. But a favorable criticism coming from a fair reviewer I trust such as yourself makes me want to give it a shot. I will keep it in mind for the future, because right now my life is being consumed by Ultimate. I’ve kind of noticed that critics of any kind tend to be really harsh on a work when there’s no obligation to like it. In the case of video game critics, they tend to promote AAA efforts over independent efforts or efforts that don’t have some kind of heavy promotion behind them like the Wonder Boy remake, which is a shame given how much effort went into it. I found it to be an underrated effort that’s worth playing while the original was a better Metroidvania than Metroid. You are right about that. It’s the power of hype, I guess. I should really check out that remake. It does look like they did an amazing job on it. I’ve always been curious about this game, having grown up without any Sega consoles as a kid. Indeed they did. They even added extra dungeons for each form, which was a great touch. I myself briefly played the TubroGrafx-16 version back in 2007, but I have little doubt the remake is the version to play. They did an amazingly good job on it. A lot of the Genesis’ library has been a bit of a blind spot for me, and this game has fallen into that. The way you’re describing it, though, it does sound rather fascinating, and it does seem to bring a lot of interesting ideas into play. And with the remake out and easily accessible, this might be one to follow up on. I still think it’s ironic how many NES games I had to go through before I finally wrote a positive review of one (the first one ended up being Super Mario Bros. 3). Then when I talked about a Master System game, a console I had always thought to be inferior to the NES, the first one gets a positive review. There are indeed many interesting ideas in play here, and though there are a few execution issues, they’re not deal-breakers. Check out the remake; I think you’d have fun with it.